Place pumpkin onto an oven tray with the chill, whole cloves of garlic and the onion halved. Roast at 180 degrees for approx. 50 minutes until pumpkin is soft. Remove onion and chilli and garlic and reduce the heat to approx. 140 degrees for another 60 minutes to reduce the moisture in the pumpkin. Finely chop the onion, garlic and chilli. 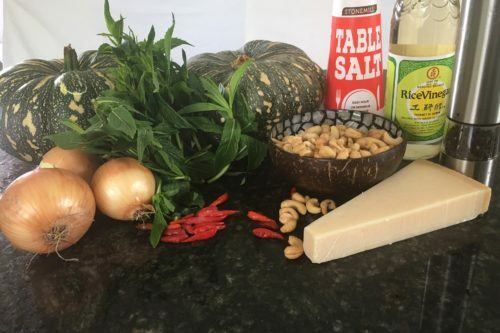 Place cashews into a mortar and pestle and grind until a chunky crumb. Don’t make it too fine or it will become a paste. Remove the skin from the pumpkin and mash the pumpkin to a chunky puree. Add the cashew nuts and slowly add the chilli/onion/garlic mix to taste. Season with salt and pepper and the vinegar and serve in peeled field mushroom caps. Top with crumbed fetta either bake/grill or bbq until mushroom is cooked. Top with green onions. Great recipe, having been a chef myself for over 30 years, it is nice to see ingredients used in the manner that they are intended and not all this dehydrated swirly stuff. For next time, when do you add the mint? Mint is roughly chopped and folded into mix when cooled.